I wrote this essay for the final assessment for ‘A History of Yoga: The Latest Research’ course in December 2018. 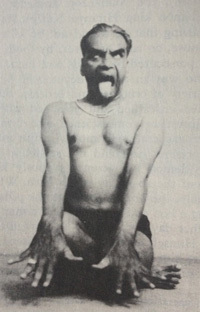 When we were discussing essay topics in the discussion forum, I found out the scandal surrounding Pattabhi Jois. I was really surprised that I didn’t know anything about it, as I am fairly involved in the yoga community - I have been teaching yoga in Bristol since 2004 and own a yoga studio called Bristol Yoga Centre. I am also a member of the British Wheel of Yoga. This news led me to investigate the extent of the historical abuse in guru-sisya relationships. I was shocked to find so many famous yoga teachers that had been accused of sexual assault by their students. I couldn’t believe I even own books by some of them! How is this possible? Why aren’t these facts more widely known? These so-called spiritual teachers are still revered by so many people and often continue to operate in the yoga community as if nothing has occurred. I wrote this essay in a state of fury and disbelief with these questions in mind. The topic is controversial and it took me a while to decide whether to share this on our blog. Please note that this essay was written by Naomi Hayama and it does not represent the studio or the opinion of the teachers in any way. In this essay, I will explore guru-sisya relations by looking at the pre-modern definition of gurus and the history of their role in yoga. I will also discuss how recent controversies have highlighted examples of gurus abusing their position of power, and question whether the traditional guru-sisya relationship facilitates this abuse. Yoga comes from an oral tradition in which teaching was transmitted directly from teacher to student. Disciples had to take extensive training and receive special initiation under a qualified guru, before worthy devotees were taught the secret of yoga. Prior to manuscripts being widely available, this was likely to be the only practical option available for learning yoga. It’s difficult to pinpoint exactly when the guru-sisya relation was developed, but Georg Feuerstein estimates that it dates back to the early Vedic period (4500 – 2500 BCE). In the Advaya Taraka Upanishad (16) ‘guru’ is described as ‘a destroyer of darkness’, from the translation of the syllable ‘gu’ signifying darkness and ‘ru’ meaning destroyer of that darkness. 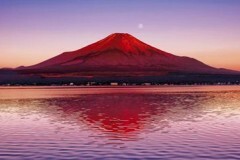 The Sanskrit word ‘sisya’ has double meaning of instruction and chastisement. It’s said to be an equivalent to the Hindi word ‘chela’ for student but can also mean servant. Gurus are said to have obtained special powers and are often considered to be an embodiment of the Divine. Therefore, students are expected to serve and obey their teacher . Through vigorous initiation and training, a spiritual link was said to be formed between them, with the aspirant receiving energy and mystical power from the guru. This special connection is referred to as lineage or ‘parampara’. Parampara is described as chain of empowerment that exceeds the world of space and time and this relationship is said to continue even after death. The role of guru in in the pre-modern yoga period was indispensable and it was assumed that ‘yoga would simply not work without the grace of guru’ . There are numerous historical yogic texts that illustrate the magnitude of guru. For example, in Shiva Samhita (3.14), it’s proclaimed that ‘Everything that is good for the self is obtained though the grace of guru, so that guru is to be served constantly, or else nothing good will happen’. Similarly, Hatha Yoga Pradipika (4.9) states, ‘who truly knows the greatness of Raja Yoga? Knowledge, liberation, stability and success are obtained from the teachings of a guru’. Lastly, in the Brahma-Vidya-Upanishad says that ‘The guru alone is Hari (Vishnu) incarnate’ (31). ‘The teacher is he who knows the eternal wisdom, the Veda, who is devoted to the All-Pervader Vishnu, who knows not arrogance, who knows the method of yoga, ever stands upon yoga, and has become yoga itself; who is pure, who is devoted to his teachers, and who has witnessed the supreme person, Purusha’ (14-18). Intriguingly, the Kula-Arnava-Tantra suggests that there are different aptitudes of gurus, verse 13.105 says that, ‘there are many gurus who are proficient in the Vedas and Shastras, but hard to find, O Devi, is the guru who has attained to the supreme truth’. This suggests that there were spectrum of gurus and superior ones were somewhat rare. Furthermore, the following text indicates that many gurus were unethical. ‘Many are the gurus who rob the disciple of his wealth, but rare is the guru who removes the afflictions of the disciple’ (13.108). In the past, the teaching of Yoga was secretive and exclusive. In contrast, yoga is now hugely popular and many people practice diverse forms and new styles of yoga. It’s currently estimated that there are 300 million yoga practitioners worldwide. According to the Yoga Journal in 2016, the yoga market was worth $80bn (£74bn) globally. In contemporary yoga, most students attend a regular group class with a yoga teacher instead of a guru. Most modern students don’t believe that their teacher has special spiritual powers or that they are an incarnation of God. Students are no longer tested or initiated and can even learn yoga from online classes or step-by-step books. It’s now common for people to emphasise the autonomy of their practice and opt to ‘listen to their inner teacher’. Even if they don’t subscribe to this notion, pupils have the freedom to pick and mix what they want to learn. Furthermore, practitioners don’t necessary come to yoga for spiritual enlightenment; they want to learn yoga for variety of reasons from stress relief, increasing physical mobility to loosing weight. Nevertheless, there are students who seek the traditional guru-sisya relationship because they believe it is a more authentic way to learn. For example, many Ashtanga Vinyasa Yoga students from around the world go and practice at the KPJAI (Krishna Pattabhi Jois Ashtanga Yoga Institute) in India to gain a genuine guru-sisya connection, or Parampara, which is said to be the hallmark of their yoga. In the twentieth and twenty first century, there have been many renowned gurus and senior yoga teachers accused of physical, mental and sexual abuse and financial extortion. The appalling irony is that they obtain their status by claiming to be an example of superior ethical standards. One of these is Pattabhi Jois, a founder of Ashtanga Yoga and KPJAI, who is accused of sexual misconduct and sexual assault by nine women spanning from the 1970’s to 1990’s . One of the victims, Karen Rain said, ‘I wanted to believe what some people claimed, and still do, that Pattabhi Jois was transferring a healing energy to me by touching me that way’. She practiced Ashtanga yoga for 11 yeas and spent 24 months in KPJAI before deciding to quit yoga altogether. Rain recounts, ‘Practicing Ashtanga yoga gave me a sense of purpose and meaning. I was part of an elite group of certified teachers and advanced practitioners…I had a sense of fulfillment, I had found where I belonged’ Rain goes on to explain why she left without accusing Jois: ‘I knew intuitively the community would dismiss any disclosure on my part and that I would encounter criticism, stigma, and disdain. Rather than speak up, I chose to disappear’ . KPJAI and the Ashtanga community have either rejected the victim’s claims or remained largely silent over the accusations. As demonstrated by Rain, there are complex reasons why people don’t speak up about abuse, but victims are unlikely to want to come forwards if time and again unethical gurus and teachers are not made accountable for their actions and continue as prominent figures within the yoga community. Kausthub Desikachar, son of T.K.V. Desikachar and grandson of Sri T. Krishnamacharya, intimidated his female students into believing that they are unwell and then attempted to sexually assault them. Even though this has come to light, Kausthub still operates as the current lineage holder of the classical Yoga tradition of T Krishnamacharya & TKV Desikachar. He is also the CEO of the Krishnamacharya Healing & Yoga Foundation. Similarly, a senior Iyengar Yoga Teacher, Manouso Manos is currently being independently investigated for multiple allegations of sexual assault and yet he is still invited to renowned international yoga conference as if nothing has happened. The yoga community has a responsibility to create a more transparent and safer environment for their students. There are many great yoga teachers that genuinely care for their student’s wellbeing, however until these issues are seriously addressed, their work will be undermined. It is important to investigate how these allegations have been dismissed and appalling actions disregarded for so long. The teachers and students dismissing these claims have often invested a large amount of time, money and emotion in their guru and the organisation. They may have even built their careers and close relationships through being part of the community. It’s easy to see why they do not want to admit that they could have been wrong to venerate a guru, when they hear that they have been accused of misconduct. It’s vital that their followers cultivate enough courage and admit when they’ve been misled, rather than choose to protect the reputation of abusive ‘gurus’. The unethical ‘gurus’ often use the mystical elements of yoga and its complicated multifaceted philosophies to facilitate their abusive behaviour to deceive many people. They may even believe that this is an acceptable way to treat students from their understanding of the historical guru-sisya relationship. The traditional idea that ‘if there is no guru, there can be no enlightenment’ places the sisya in a position where they must submit to the will of the guru in order to achieve spiritual progress. This creates an extremely un-balanced power dynamic between the guru and the sisya. We can clearly see from the number of allegations made against gurus that there is a common abuse of this position. The full range of allegations made towards gurus is beyond the scope of this essay to fully address but I find it deeply disturbing and feel that it warrants much further attention. I do take some optimism from the fact that more victims are prepared to come forwards and call out abuse especially since the #metoo movement. I hope that we can create a more open culture where trust in teachers and gurus can begin to be restored, but until there is public acceptance and reconciliation of these offences then I see little progress being made. 1. Carrico M (2007) A Beginner's Guide to the History of Yoga, [online] available at: https://www.yogajournal.com/yoga-101/the-roots-of-yoga [accessed 14th December 2018]. 2. Singleton M & Goldberg E (2014) Gurus of the Modern Yoga, Oxford University Press, New York. 3. Feuerstein G (2008) The Yoga Tradition - It’s History, Literature, Philosophy and Practice, 3rd Ed. Hohm Press, USA. 7. The Good Body (2018) Yoga Statistics: Staggering Growth Shows Increasing Popularity. [online] available at https://www.thegoodbody.com/yoga-statistics/ [accessed 19th December 2018]. 8. Delaney B (2017) The yoga industry is booming – but does it make you a better person? [online] available at https://www.theguardian.com/lifeandstyle/2017/sep/17/yoga-better-person-lifestyle-exercise [accessed 22nd December 2018]. I’ve just completed a course on the history of yoga, which proclaimed that the word ‘yoga’ was first recorded in the Katha Upanishad (estimated 300 BCE). In 2007, I made a short animation called ‘The Secret of Death’ based on the Katha Upanishad for my final year of Illustration with Animation degree. Katha Upanishad is said to be challenging to translate, as it contains many difficult and unique terms that are not clear. This short animation is a very simplified adaptation of the tale between a boy named Naciketas and Yama, the God of Death. It’s made using shadow puppets and stop motion techniques. I remember making many puppets and background pieces, and spending lots of time in the dark moving them frame by frame. It was a frustrating but a meditative experience. I managed to get a lovely sitar player called Wasif Mullick to make the music and a friend called Tom Heron to narrate the story. My partner, Laurie Gibbs also helped too. After graduating, I did a bit of illustrating work but I mainly focused on teaching yoga. I do miss the creative aspects…maybe I will do something like this again. Community means to belong, to be a member, part of the whole. Scientific researchers prove the connection with others and belonging are as imperative for one’s survival as food and shelter; they are instinctual. In fact, they are so crucial that any threat of rejection conjures reactions that are almost identical to those of actual physical pain in the body. This pain is caused by the hormonal triggering of the sympathetic system (region where flight-or-flight response takes place) and the parasympathetic nervous system known as ‘autonomic conflict.’ We all feel that as it’s part of our nature but we often fail to communicate it and express it. Teaching my class is something I’m grateful for on a daily basis. It’s my way of helping to build a sense of community and sharing the gift of yoga and practice of connection. Holding space for people creates safe environment for practitioners where they can engage with themselves and others. Together we explore our edges and the physical and mental challenges that practice can bring to surface. We build fire, fluidity and sthira (steadiness) through asana and pranayama. We let go of ‘what was’ when we just arrived into the space. That togetherness in such intimate experience is the glue forming the connection between strangers. Most importantly, it opens and expands individual’s perceptions. How does that happen? When we arrive in a class we see people of all backgrounds, age, race, body shapes. A big percentage of them will judge for one reason or another. We’ll completely exclude the possibility of connection or simple dialog with them based on our prejudice. (Prejudice are inaccurate judgements of situation/ person when we lack sufficient information to make an actual judgement). However, if we meet a person repeatedly we will start noticing things about him or her. Whilst practicing together, we will feel his/her presence more accurately, especially engaging in parner work (a substantial part of community classes). We will start to notice their movement, reactions and even support. We will be challenged together and even laugh together. Over time we will gradually get to know the individual and notice a shift in ourselves. The shared experiences may not make that person your best friend, but it will help you to accept them rather than rejecting them. Less rejection, less pain. Victoria Andreeva teaches a weekly donation based community Krama Vinyasa Flow Yoga on Saturday morning from 11:30 – 12:45pm. The class is open to all levels of students and you will be encouraged to explore and gradually expand your edges in a integrated and fun manner. Yoga offers many health benefits and one of them includes alleviating insomnia. Through stretching, breathing, and mindfulness yoga improves your strength and flexibility, breathing, reduces stress and enhances brain functions. A recent study has also found that yoga can help you sleep if you have chronic insomnia. The Harvard Medical study looked into how doing yoga every day could affect people with insomnia. The study conducted began with subjects learning how to do basic yoga. They were then asked to maintain the daily practice for eight weeks. Diaries were kept before the yoga began for two weeks before. They also took notes during the eight weeks of daily yoga. In total, twenty people completed the eight week study. Researchers then analyzed the information given to see if yoga helped with their chronic insomnia. Primary insomnia is the inability to sleep that occurs on its own. It is dependent on health problems or a sleep disorder. Secondary insomnia occurs as a system when there is another medical condition within the patient. This can be anything from cancer to chronic pain to depression. Some of the medications taken for acute health conditions can also cause insomnia. While there hasn’t been a lot of research conducted on yoga and how it affects sleep, it is possible that yoga can be used as a treatment for sleep issues. The reason you’re not sleeping could be for many reasons. Some have fibromyalgia so their chronic pain keeps them up at night. Some people just can’t seem to ‘switch off’ and they lie awake ruminating about things. Whatever the reasons, there is a yoga pose for pretty much every issue that is causing you to lose sleep. These basic poses are specifically to calm the body and mind before bed. You may also want to incorporate poses that help your specific medical conditions also. To get ready for bed, put you pajamas on. Turn the lights down and get yourself comfortable. Sit cross legged or in a comfortable position. Close your eyes and start to focus on your breathing. Do this for a few minutes. When thoughts come up, don’t hold onto them. Go back to the breath. This is to bring you to your center and to quiet the mind. As you sit cross legged, inhale and make yourself as tall as possible. As you exhale, you will twist your midsection to the left. If you have something to grab onto, you can use this to go slightly deeper into the stretch. Remain in the twist while breathing a few times. As you exhale, return your torso back to center. Inhale and then exhale your twist to the right side. Repeat this a few times. Take it slowly. With your legs still crossed, bend forward from the hips and stretch your hands out in front of you. If you can get your belly to your feet and your head to the floor, that’s ideal but this may take some time to master. Stay here for a few breaths and notice the stretch your experience in your hips and back. Bring your legs out in front of you so they’re straight with a slight microbend in the knees. Sit up high as you inhale. When you exhale, reach your hands out to your feet. You want to keep your back flat which means you may have to bend your knees. This pose stretches out the hamstrings which alleviates pressure in the lower back. Lie down on your back and put your head on your pillow. Bring one knee into the chest and grab your shin to pull it closer to you. Stay in this pose for a few deep breaths. Switch legs and repeat a few times. Then head both your knees into your chest. Rock side to side onto your back, allowing your whole back to relax and release. Knees to chest pose lengthens the extended knee while loosening tight hips. This is where stress lives so releasing it before bed can be quite helpful in relaxing you. Doing these poses before bed can help you sleep. They are deeply relaxing and help to calm the mind as you are doing something physical. When you do yoga daily, you are also going to alleviate some of the pain or discomforts you’re experiencing that are the cause of sleep loss. Back from a yoga retreat in heaven! I’ve just come back from teaching in an amazing 7 night yoga retreat in Chamonix, France. This year we’ve teamed up with Bluerise Retreats and organised a yoga, hiking and spa holiday in a luxurious chalet with a stunning view of Mont Blanc and the Bossons glacier. The weather was so great that we practiced yoga outside overlooking the magnificent mountains next to a stream with lots of wild flowers. Spring is so magical in Chamonix! The chalet had large outdoor Jacuzzis, a steam room and sauna which was especially nice after the alpine hikes. Suzi, our hike guide was lovely and very knowledgeable about the local wildlife. I even managed to see ibex and a golden eagle! We also practiced yoga in the mountain during one of our hikes. We had a lovely mix of people from different age groups, nationalities and experience of yoga. Some people were training to be a yoga teachers but we also had a beginner that’d never practiced before. He said he really enjoyed yoga and wanted to do some more when he got home. We did an energetic class in the morning and restorative session in the evening. We had time to explore different practices such as Yin yoga, Yoga Nidra, Pranayama, chanting and mudras. I really enjoy teaching mixed abilities students and knowing that everyone can do yoga together. The food at the retreat was exceptional. Lisa, the chef is a vegetarian and lovingly prepared 3 course meal for us every night even though she was heavily pregnant with twins. You could see that she loved cooking! I don't think I've had such a creative and delicious vegetarian food before. Her breakfast, lunch and snacks were equally exciting and tasty. Bluerise retreat team made every effort to make us all feel at home. They were so friendly and delightful people to be around. They even arranged a luxurious Spa day out in Italy and a movie night with popcorn! There were lots of organised activities but we also had free time to do other things. Some people went climbing together or just relaxed and enjoyed the Spa facilities! We talked about doing another yoga retreat in Sri Lanka together so watch this space! It will be lovely to work with Bluerise Retreat again. In the meantime, Bristol Yoga Centre has organised another wonderful yoga retreat in France from 20-27th June 2018. We are currently offering 10% off, please see here for details. I just wanted to share how we decided on our new logo for Bristol Yoga Centre. It started with me doodling on a piece of paper on my way back from a yoga retreat in Spain couple of months ago. As you can see from my drawing, it started off incredibly simple. I knew that I wanted something instantly recognisable as yoga and something bright and colourful. The logo also had to represent 'centre' and when I looked into the definition of the word, I was glad I chose 'Bristol Yoga Centre' for the new studio name. One of the nouns is 'the most important place in the respect specified' but another said 'the filling in a chocolate'! Another definition is 'the point that is equally distant from every point on the circumference of a circle or sphere' so we looked into mandalas'. Mandala means circle and the word ‘mand’ means essence, energy or spirit, and ‘la’ meaning container. Therefore, Mandala can be interpreted as the container of energy. It's a spiritual and ritual symbol in Hinduism and Buddhism, representing the Universe. How cool is that!? I also wanted to incorporate Chakras or the 8 limbs of yoga, and we eventually settled on using the seven colours of Chakra. Meditation practice is an essential part of yoga practice. And yet, yogis are often accused of just preparing to practice meditation without actually doing it! We tend to be very good at practicing asana and pranayama but quite often skip meditation altogether. When we actually do practice, it tends to be for a short time either at the beginning or end of the session. Classical yoga is the ‘practice of settling the mind’ and we achieve this by following the whole of the Eight Limbs of Yoga. Dhyana is the 7th limbs of the Eight Limbs of Yoga, and it’s often translated as meditation, reflection and profound contemplation. The root of the word ‘meditation’ is similar to medical or medicate and the word implies a sense of ‘attending to’ or ‘paying attention’. In 2014 I took an 8 month BWY meditation module with Kay Baxter, it was refreshing and enlightening to focus purely on the practice of mediation. Kay is one of the senior British Wheel of Yoga teachers and specialises in meditation. We met once every month to practice meditation all day, we also did little bit of asana, singing, listening to music, breathing and relaxation techniques but the main focus was on meditation. ‘In this deeper, stiller place you can discover many things. You will uncover your own truths. Truths that are universal, but that you experience and appreciate in your own individual way according to your life and understanding. An opening is created, a space where the deep intelligence may rise up and insight descend such that we can begin to know. Knowledge that is not information gleaned from books, but that carries with it a deep feeling connection, such that there may be a sense of coming into alignment with something that is clear and true’. Meditation practice has been around for centuries and with some guidance, it is accessible and available for everyone. If you are interested in starting meditation, come along to Kay Baxter’s Wednesday morning meditation from 10 – 11am at the Bristol Yoga Space studio in central Bristol. Kay’s class is structured in a way that it is accessible and enjoyable for everyone including beginners. Don’t worry if you cannot sit comfortably on the floor. We have chairs and props to make sitting more accessible. Kay will also be running series of Meditation workshops from May 2017. Developing a consistent home yoga practice is one of the most rewarding and important activities for serious yogis but it can also be one of the hardest things to achieve. A regular practice requires motivation, creativity, discipline and confidence – all qualities that are really worthwhile to try and develop. I’ve met dedicated students that attend taught group yoga classes almost every day and yet find it a real struggle to get on their yoga mat alone at home. This is important to remedy as it’s within a regular home practice that we truly discover and connect to ourselves. As Tara Frazer in her book ‘Yoga for You’ says, ‘Although you will learn a great deal from a teacher, you will experience most of yoga’s benefits by practicing alone. This is because, ultimately, yoga is a process of self-realisation and you are the best expert on yourself’. No matter how excellent your yoga teacher is, they will never be able to feel and connect to yourself like you can. Instead of relying on other people, you can begin to look after yourself. When we know ourselves better we are in a much better position to take care of our minds and bodies. One of the greatest benefits from my own practice is the ability to really listen and adapt my practice to suit my changing needs. I believe this is an essential point as no matter how strong or flexible you become, if you are unable to modify your practice when you have injuries or at challenging times then it’s severely limited. In fact, it’s during these times that our yoga practice should help and support us. The yoga practice then becomes a therapeutic transformative activity for the individual. Gary Kraftsow, a senior viniyoga teacher said ‘...Yoga lies in the adaption of the practice to the individual, not in the adaptation of the individual to the practice’. When designing a balanced personal practice, Krafsow says to respect our individual situations and requirements and take into account constitution, place, gender, time, age, capacities, aspirations and activities. It is easy to ignore our personal needs and circumstances and set unrealistic aims and goals in our practice. Yoga is not something we accomplish but it is a life long development. You will naturally find that your practice will continuously grow and change. Over time my own practice has changed to be more self-reflective and contemplative. It is now much less about achieving certain postures or complying with rigid ideals. I do my home practice to try and achieve greater harmony and balance within myself. I believe these important changes have come from my continuous personal practice. 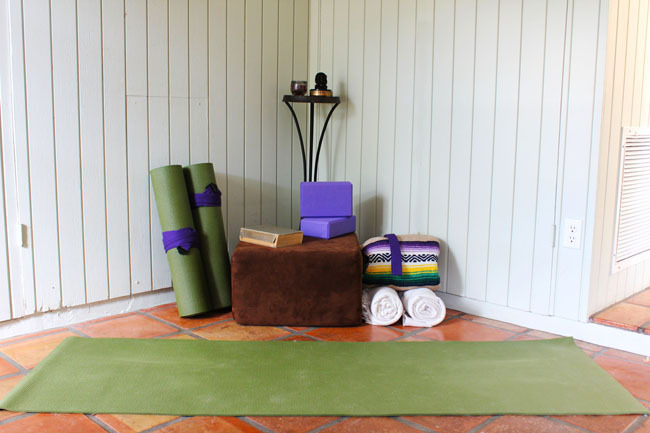 In the next part of this blog, I will give tips and advice on starting a home practice. I caught a particularly bad cold earlier in the year and had to adapt my personal yoga practice. I didn’t have the energy to do my regular asanas so I chose to do restorative postures instead. I thought I would write about the benefits of poses that I used to help. I believe that it’s really important to be able to modify our practice to suit our changing needs. My personal practice enables me to connect and reflect on what’s going on within my life. It’s imperative that we learn to listen to our body and adapt our practice as much as necessary. This is a great heart and hip opening pose, especially beneficial for relieving some symptoms of a cold. When you’ve got a cold, it can be difficult to do forward bends but this is a lovely calming and relaxing one to do. Similar to forward bends, inverted postures can be challenging postures to practice when your feeling under the weather but you can practice this pose easily. It is also said to be a great pose to encourage you to get a good night’s sleep. The trick to getting close to the wall is to start by sitting very close sideways and flipping your legs 90 degrees. If your buttocks are still far away, use your elbows to nudge yourself closer.